Content Management is the processes and technologies by which an organisation creates, publishes, and manages its digital content. Digital content can take the form of text, images, audio and video as well as web content such as webpages. The goals of an organisation will inform its content management strategy. The content management process will facilitate the execution of that strategy. In general, content management helps organisations to effectively use their content to help the organisation achieve its goals. This is often achieved by using a Content Management System (CMS). 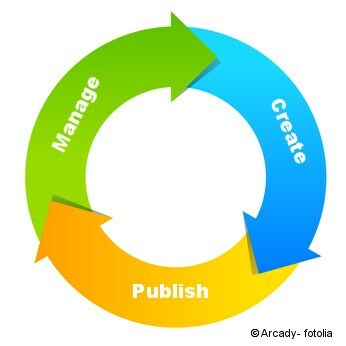 The stages of creating, publishing and managing digital content are often called the content management lifecycle. Analyse: The business goals of the organisation are reviewed and digital content requirements are decided. Plan: A content management strategy to create, publish and manage the digital content is written. Measure: The metrics that will be used to test the success of the strategy are decided upon. Governance: Who is responsible for creating the content, editing the content, having overall responsibility for sign-off, and other roles, is decided. The systems and technologies that will be used to manage and govern the content are decided on. Design & Build: New digital content is created or collected. Metadata for classifying the content is written. Review: Content including metadata goes through editorial processes. Store: Content is stored in a content depository e.g. a CMS. Content is assembled into the different formats required by different channels for publishing e.g. language type. Security: Access and edit rights to the depository and the content are decided upon. Final Review: The content goes through review sign-off processes. Publish: The content is launched live on all approved channels. Results: The performance of the content is measured (as per the metrics decided at the Create stage) and the success of the content is determined. Audit: Outdated or underperforming content is marked for retirement, research is carried out on new technologies or methodologies that could help improve the content management strategy, and the content management life cycle begins again. Do you need support with the preparation of SEO texts? Please consult us for more information about our solutions! A common technology used to carry out content management is a Content Management System or CMS. Content management systems create a central location where the content is stored to make it easier for people to collaborate. Content management systems usually keep track of changes to a piece of content, a process called version control, which helps people working together to be more efficient. Using a CMS can be more cost efficient because handling the content management in one location can save money on security, backup and translation. Most CMS platforms feature the ability to publish content such as webpages or images to websites. These are known as Web Content Management Systems (WCMS) and examples of these systems include WordPress, Drupal & Joomla!. For large organisations, there are enterprise-level CMS platforms which include web publishing as part of their solutions. For example, Microsoft offers web publishing through their Software as a Service (SaaS) product Microsoft Office 365.